Create and compare MD5 checksums. Is there a better alternative to MD5? 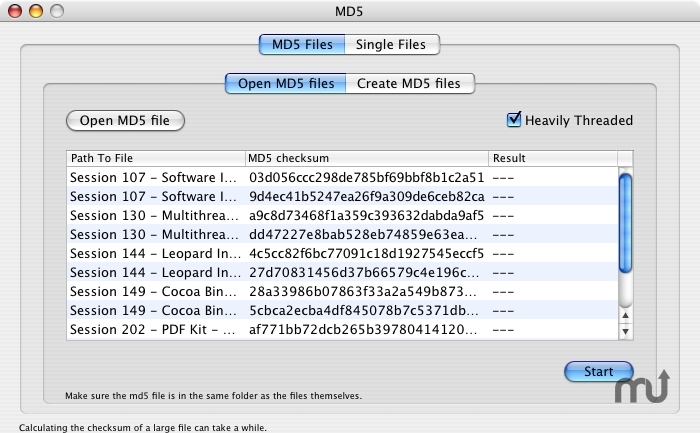 Is MD5 really the best app in File Management category? Will MD5 work good on macOS 10.13.4? MD5 is a utility that lets you create and compare MD5 checksums. It can compare files as well as a file with a checksum-string. Or you can simply let the application calculate a checksum. Ease of use. MD5 is extremely easy to use. You want to compare two files? Just drop them together onto the application and MD5 will tell you if they've got the same checksum. Want to create a checksum of a file? Just as easy. Drop the file onto MD5 and it will tell you the checksum. Have an md5 file? Just drop it onto the application, it will handle everything for you. Want to create an md5 file? Just as easy.